For a limited time our CEO, Adam Novak is currently offering 1-on-1 personalized drone flight training classes! Call (863) 333-4265 for more information. 3 separate flight times (beginner, intermediate and advanced). That's 3 TOTAL HOURS of FLIGHT TIME! For a limited time our CEO, Adam Novak is currently offering 1-on-1 personalized drone flight training classes! ​Call (863) 333-4265 for more information. Can't attend this one? We can keep you informed about our future training classes. A: NO. Please leave your drones at home. We have A LOT of material to cover and 3 hours of hands-on flight time! Using our drones will keep the training process smooth. This will also give you an opportunity to fly some drones that you might not have before. Also due to liability insurance reasons you are required to fly our drones. A: Awesome! Our training is designed with you in mind. The 3 flight training sessions are broken down into beginner, intermediate and advanced. By the end you will be hand-catching the drone instead of landing it on the ground ~ Wooo Hooo!! Q: Will you hold this event in other locations? A: Yes. Currently we are scheduled for events in Lakeland, Florida due to it's centralized location from Tampa and Orlando. Please fill out our Contact Us form and let us know where you would like us to hold our next event. Q: What authority does Drone Elevations have to issue a pilot’s licenses? A: None. Drone Elevations is NOT issuing pilot’s licenses. We are providing drone training, a certificate of completion (after successfully completing the training) and issuing drone operator cards. Q: Will every member who attends Flight Instructor Training Certification automatically pass and become certified? A: No. Unfortunately, if you cannot demonstrate the skills, knowledge and safety level required, and you do not pass the tests, then you will not be certified. You will have an opportunity to retake the test for free when you feel more confident. Q: What good is a certificate of completion signed by Drone Elevations? A: Lots! If you become a certified Flight Instructor with Drone Elevations, your certificate means that you have attended our flight instruction course, you understand the basics of flight, flight safety, equipment handling, basic photography and videography. 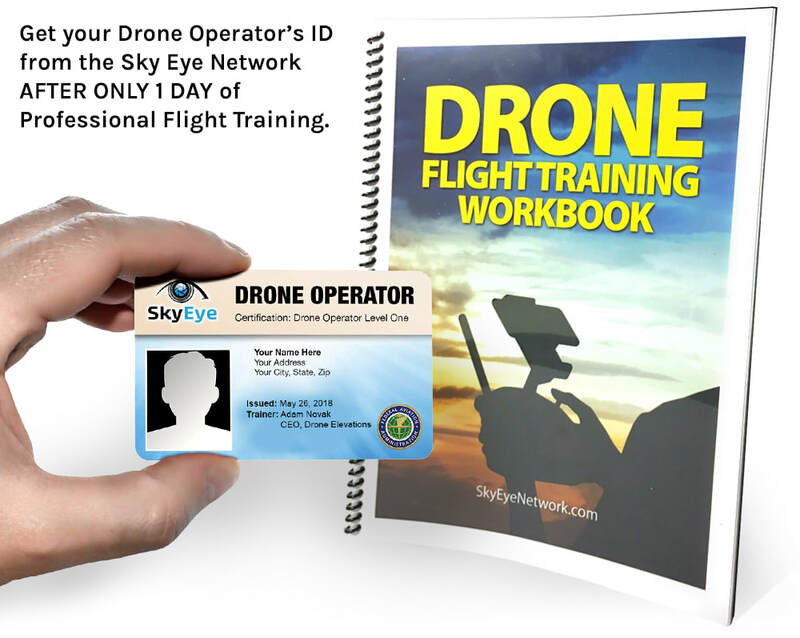 Not only will you receive a Certificate of Completion from your instructor, but will also be issued a Drone Operator’s ID Card. All of these certifications are in association with the world's largest network of commercial drone operators ~ the Sky Eye Network. That carries a lot of weight! Q: How is Drone Elevations qualified as Flight Instructors? A: Your Flight Instructor has over 150 flight hours. When you attend the Drone Elevations Flight Instructor Training program, you will train with Adam Novak, our CEO. There is a specific curriculum you will follow, along with a flying and written test that you must pass to become certified. Keep in mind Adam is the best of the best as far as commercial drone pilots are concerned, and his job will be to ensure that by the end of the training you have the confidence to fly a drone professionally. ​A: Credentials. This is an elite credential you have to your name. The certification from our flight training and your FAA 107 license position you as an expert in your market. A: Yes. However a private session request does increase the seminar price. Call (863) 333-4265 to schedule. ​A: Yes. If you are not satisfied you will be given an opportunity to express your concerns with our flight instructor mid-way through the class. If it's deemed that the seminar is just not right for you a refund will be given.